An important difference is that a data visualization is just one (i.e. 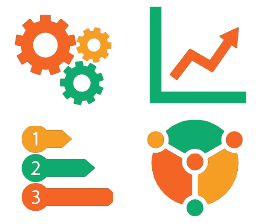 a map, graph, chart or diagram), while an infographic often contains multiple data visualizations. A second key difference is that infographics contain additional elements like narrative and graphics. Besides that, more work tends to go into the design of infographics, to make them more impactful and aesthetically pleasing. The following table provides an overview of the key differences between infographics and data visualizations. Design and aesthetics Often a lot of work goes into the design and making it aesthetically pleasing These are for the most part automatically generated using Excel, StatPlanet, or other software; if published or used in presentations, more attention is paid to the design. Includes graphics, clipart Generally yes, to add visual appeal and provide more "oomph" Sometimes included, but generally frowned upon by data visualization specialists as "chartjunk"
Hopefully this provides some clarity as to the differences between infographics and data visualizations - and shows that in many cases differences are quite subtle!